Royal AHOLD moves key logistics application to Open Source using COBOL-IT. Cobol-it > IBM COBOL > Royal AHOLD moves key logistics application to Open Source using COBOL-IT. Royal AHOLD has moved a key logistics application from z/OS onto Sun Solaris and in the process, implemented the open source COBOL compiler from COBOL IT France, achieving amazing savings, with zero compromise. AHolD has gross revenues of over €28BN per year, and 120,000 employees world-wide. 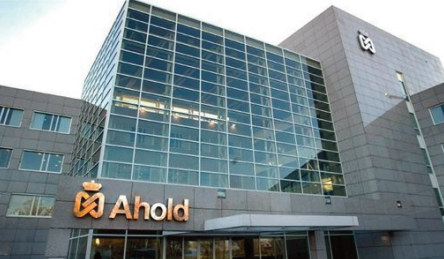 AHOLD is a major international supermarket operator based in Amsterdam in the Netherlands. AHOLD is listed on Euronext Amsterdam Stock Exchange, turning over in the region of €28BN per year, with approximately 120,000 employees world-wide. At the heart of their successful operations is their seamless logistics, operating a rigid just in time replenishment model, enabling AHOLD to operate their Supermarkets and Hypermarkets successfully. AHOLD’s mission-critical logistics applications were hosted on a shared Mainframe, managed by Hewlett Packard, on which AHOLD applications ran on a Logical partition. The AHOLD IT Department was challenged to convert the application into a more modern architecture, free of all development and integration barriers, without having to pursue a hasty change due to increasingly burning legacy issues. AHOLD examined different solutions for moving the logistics application off of the mainframe onto a more cost effective and efficient open platform. As the application is deemed mission-critical in their business, there was zero tolerance for any kind of adversity. No downtime could be accepted, and many proposals were rejected on the grounds that they represented too big a risk. Cost savings, and increasing requirements created an urgency to migrate to open systems. Re-host the logistics’ application to a Sun Solaris platform in a short time-frams, with zero interruptions to the operations, and keep costs down, to maximize ROI, and achieve a speedy payback. There was zero tolerance for any kind of adversity. No downtime could be accepted. The applications in question operate mainly in a batch mode, but also support approximately 120 concurrent users working online. The solution entailed the migration of DB2 data tables into an Oracle data base, and the implementation of the HTWC XFRAME suite and COBOL-IT® Compiler Suite Enterprise Edition. Contributing towards the required financial savings was the replacement of the legacy COBOL compiler with the open source COBOL compiler from COBOL-IT. In the AHOLD Solution, which involved 3000 COBOL programs, and 300 DB2 tables, which were migrated into an Oracle database, the COBOL-IT product provided all of the necessary functionality, and surpassed all required performance benchmarks, at just a fraction of the cost. COBOL-IT is now fully integrated into the HTWC Solution Stack, providing a fully functional Open Source COBOL solution. “The quality, versatility and ease of implementation of the COBOL-IT Compiler Suite surprised us, and we were already familiar with the product”, said Stefano Galletti, senior systems engineer with HTWC. The COBOL-IT solution is engineered to match market requirements, and provides an outstanding combination of quality and price. The COBOL IT business model entails no upfront steep licensing costs, whilst maintenance and support costs are actually less than their nearest competitors. It is a modern business model, which is perfectly adapted to HTWC’s market. Major cost advantages were achieved. Addressing one of the major issues, the migration of applications and databases away from the Mainframe to the more cost effective and efficient Linux operating system achieved major cost advantages for AHOLD. The ROI metrics illustrated below are based upon an amortization period of 5 years, taking into consideration all investment costs, capital costs, operating costs and annual savings. 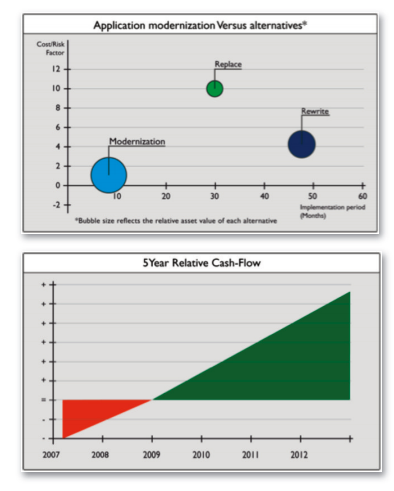 The 5 year cash flow shows the relative relationship between investment + operating costs and the savings. The reduced staffing, development and integration costs are not reflected in these numbers, and further enhance the extent of the achievement. Analyses shows that opting to re-write or replace the applications brings with it additional cost, risk and the turn-around time is a lot longer. Not to mention the cultural change and loss of key intellectual property. Some key ratios based upon the net present value of the savings achieved, illustrate impressive returns in a very short period of time. This was all achieved with minimal disruption to the daily operations. Additionally the system performance has improved which will reflect on productivity and reduced hardware needs going forward. Success is attributed to the powerful combination of XFRAMe and coBol-it. In retrospect, success on the project is attributed to the ability of HTWC to understand the needs of the customer, and use its software, and experience in project management to stage the migration without interruption to daily operations. COBOL-IT ensured that aggressive cost-savings goals and high performance requirements could be met, and the full integration of the products facilitated the implementation.